In this step 1 we will learn how to create a skeleton of a Native iOS App from the SAP Cloud Platform. This App will consume the ES5 Back-End thanks to the es5 destination that you will be asked to create in the prerequisites. We will use this skeleton in the next tutorial to generate the real application thanks to the Assistant of SAP Cloud Platform SDK for IOS. 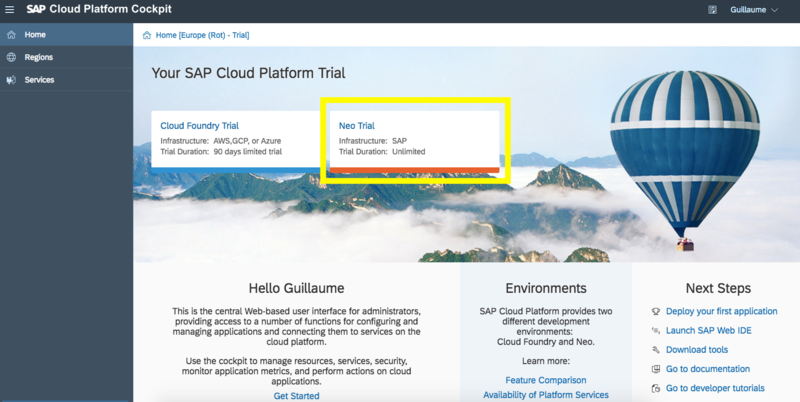 You need to have a SAP Cloud Platform Account to follow this tutorial. If you don’t have one yet, please click on this link and follow the tutorial made by lpareek. You need to create an account on Gateway Demo system to follow this tutorial. If you don’t have one please click on this link and follow the tutorial made by Jonathan Baker. You need to create a ES5 Destination on SAP Cloud Platform, to do so, please click on this link and follow the tutorial made by Jim Jaquet. 1. Sign in to SAP Cloud Platform https://cloudplatform.sap.com/index.html. 6. Click on New to create a new Application. In Connectivity section you can manage destinations that your application will consume. 9. Click on + to add a connection. 10. Choose es5 and press OK. Your Native iOS App skeleton is now created and linked with the es5 destination ! In this step of tutorial you discovered the SAP Cloud Platform Mobile service from which you can manage and configure your mobile applications. You also learnt how to create a native iOS application skeleton on this service. This skeleton will be helpful to generate the real iOS application thanks to the SAP Cloud Platform SDK for ios Assistant. In step 2 of this tutorial, I will show you how to easily generate a Native iOS application (Fiori Master/Detail template) without any coding with the help of SAP Cloud Platform SDK for iOS Assistant tool.